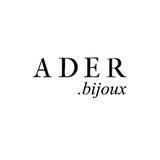 ADER（アデル）： 艶やかな女性の時間を彩るアクセサリー 大人の女性が華やかに輝くに相応しい、ヴィンテージやデッドストックパーツ。 時を経て受け継がれてきた物が持つ艶やかな存在感が、 ワードローブで長く愛され続けるものでありますように。 - - DESIGNER　BIOGRAPHY - - 英里 リストリ フランス、パリ在住。 パリのコスチュームジュエリーブランドでのデザイナー経験、西洋美術史を学んだ後、2013年S/S collectionよりコスチュームジュエリーブランドADERを立ち上げる。 ADER is from the Japanese word ADEYAKA which means women’s fascinatingly elegance of beauty. We makes the costume jewelry with european vintage or dead stock pars, also making contemporary and modern jewelry collection inspired by vintage style. - - DESIGNER　BIOGRAPHY - - Eri RISTORI Lives in Paris, France. After having an experience as a designer of French costume jewelry brand, she launched ADER 2013 S/S collection in Tokyo, her hometown.